This article on the perils of positive thinking really jumped out at me. I've noted before the growing backlash against the self-help movement and its relentless feel good message. There is much to relate to in the author's failed attempts at self-improvement. Like so many of us, he learned that there are no panaceas. Most interesting are comments from the author of a soon to be released book on the pitfalls and limitations of the self-help industry. Ultimately, Burton says, the true path to happiness doesn’t lie in thinking positively or mimicking the seven habits of highly effective people but instead in cultivating a greater self-awareness. He believes that our estrangement from that awareness, and our increasingly manic obsession with all things us, represent a departure from our natural instincts as human beings. “In traditional cultures, people lived in very close knit communities. They knew each other, and they didn’t really focus on themselves so much. The focus on life was on the survival community and not on their own individuality. Modern society is very different from that. There’s a huge emphasis on me; my goals, my life, my death. That puts a lot of pressure on people, and it’s not the kind of pressure that we’re evolved to cope with. That’s the source of many of our problems." So much of The Secret and its ilk is all about separating yourself from people and making yourself better and more successful than everybody else. So little is on cultivating human relationships or uplifting humanity as a whole. I'm still at a loss, for instance, to understand how Rhonda Byrne's advice to "not observe" fat people as a weight loss plan advances the human condition. Yes, I do keep coming back to that example... because it's heinous. And then there's James Arthur Ray who has so perfected self absorption that he's repeatedly failed to notice serious injury and death among students in his own seminars. I can't help thinking that someone who knows so well "how the universe works" could come up with loftier ways to apply that knowledge than the endless pursuit of personal wealth and success. But James Arthur Ray, like most motivational speakers, is focused on "top achievers" and how to become one. My new favorite Ray category: the "higher, upper echelon of people on this planet." How does that advance a community or the world? It separates us from them... as if the world weren't already sharply divided between haves and have nots. Many Messengers of the Light thought they had some higher purpose :: that they were going to help shape a new and better world. But James was having none of that :: after The Secret he significantly raised the prices of his events … and he broke up the old club. Because of The Secret he actually did a call with us, and my husband probably has that recorded where he said you know where he disbanded the fraternity, he got rid of the (Inaudible) we are not going to do any of that stuff anymore. We’re not, he says, because I can’t, all it would take is a picture of us walking around in white robes to show up on Oprah and you know the whole thing will be done. And I’m like okay what, I thought this was something that was supposed to be important, we were all on the same page here, we are trying to make a better world for people and that’s really not what we’re about, so good bye. I'm not even going to try to make sense of the hodge-podge of world traditions repackaged around pop themes that make up James Ray's "philosophy." I just find it fascinating how quickly and easily he discards those practices when they no longer fit the image he wants to present; shedding all interest in improving the world with a wardrobe change. It's all style over substance. What apparently became clear to Martha Stern was that Ray had no real interest in helping the world beyond James Arthur Ray and that he was teaching that narcissism as a way of life. This is not to say being self-focused is bad in and of itself and I should distinguish again between the self and the ego. As I said here, expecting the universe to be your personal "catalog" or "genie" is pure ego indulgence. Self examination, however, is also an integral part of spiritual growth. But that kind of inward focus is ruthlessly suppressed in the self-help movement. From Lisa Nichols not wanting to hear anyone's "story" to Bob Proctor's advice that you put on cheerful music to drown out your bad mood, the association of personal growth with "staying positive" is stultifying. I'm currently reading the excellent, but sadly out of print, Beyond the Ashes . In it Rabbi Gershom describes his frustration at getting any spirituality group to allow him to do a seminar on the many cases of Holocaust reincarnates he was encountering. Then in 1984 I was invited to speak on Jewish mysticism at the annual Spiritual Frontiers Fellowship (SFF) retreat at Carleton College in Northfield, Minnesota. SFF is an eclectic group of spiritually oriented people who are interested in psychic phenomena, and most believe in reincarnation. Here, I thought, would be a receptive audience for these case histories that I had been gathering. So I suggested "Cases of Holocaust Reincarnation" as my topic. I was turned down flat. The SFF representative explained that the theme of the retreat would be "I Am the Light," and they wanted to focus on uplifting, positive material because that's what people expected. The Holocaust was just too heavy and depressing, and might upset people, even if I were talking about reincarnation. Couldn't I do something more inspiring, like a Sabbath liturgy? Not surprisingly, when Gershom was finally able to get something published on the topic, he was flooded with requests from people who were troubled by past life memories of horrible deaths in Nazi Germany. The need for healing on this issue was, and is, very real. And true healing cannot happen without acknowledgment of painful issues and emotions that conflict with the "love and light" focus of so much pop spirituality. The human condition is one of darkness as well as light. Ironically, as Dr. Burton shared with me during our interview, the idea of embracing our flaws rather than trying to bench press them out of existence, is a form of wisdom as old as society itself. 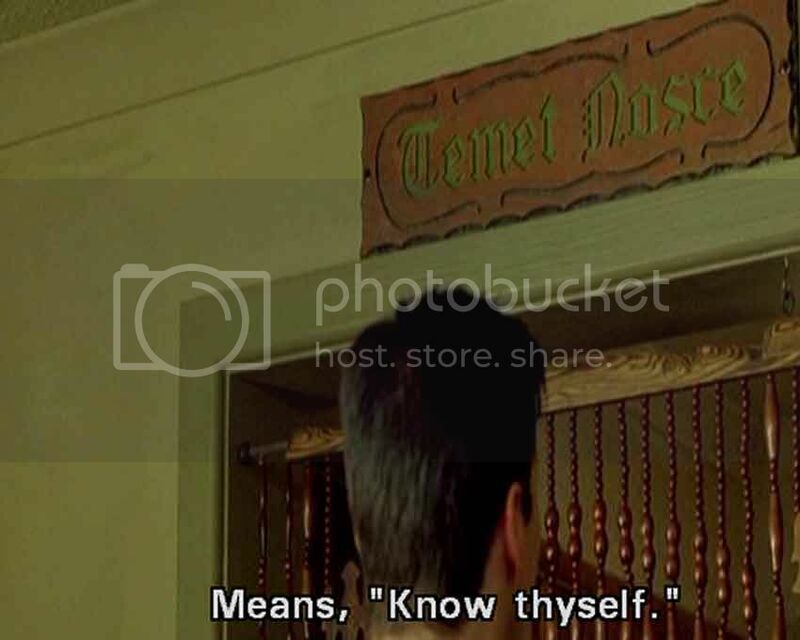 Inscribed on the Temple of Apollo, the revered site where leaders of the ancient Greek world would consult the Oracle of Delphi on any matter of significance, is one particularly important phrase: “know thyself.” To bend an old cliché, when it comes to the self-improvement industry truer words have never since been spoken.